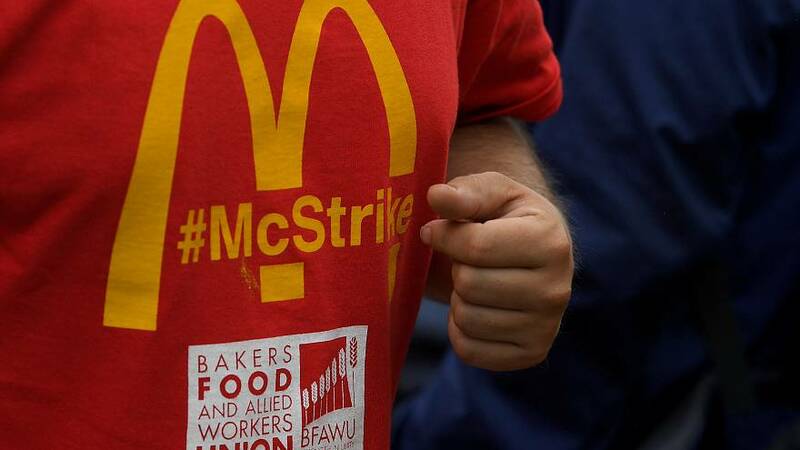 McDonald’s has been hit with its first strike in the UK since opening there 43 years ago. Workers from two restaurants in Cambridge and Crayford, London are demanding pay increases to around 11 euros per hour, an end to contracts with no fixed hours and better trade union recognition. Fourteen staff members went on strike. A spokesman for the fast food chain said that number represents less than half of the 33 union members who were balloted. He claimed the demonstration was over internal grievance procedures, rather than pay or contracts. The company and its franchises are reportedly offering personnel the option of a guaranteed hour contract, but the spokesman said so far 86 percent of people had chosen to stay on flexible contracts. Small demonstrations backing the workers have taken place in 14 locations across the UK. The strikes coincided with similar action in the US and Belgium.